The holidays are here and it’s the season for giving. 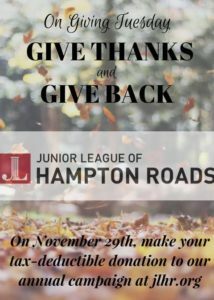 The Junior League of Hampton Roads cordially invites you to participate in our First Annual Giving Tuesday Campaign on Nov. 29th! We all know about Black Friday and Cyber Monday. Giving Tuesday is an international movement intended to foster giving at the beginning of the holiday season. You can participate by donating below! These Annual Campaign funds directly support the mission of the League, our efforts, and make a huge difference in our community. Most recently, through a Community Involvement Fund request, our Annual Campaign funds helped a woman living in the Hampton Roads community, who has been unable to work as she is the primary caregiver for her daughter, who just had brain surgery, and her grandson.